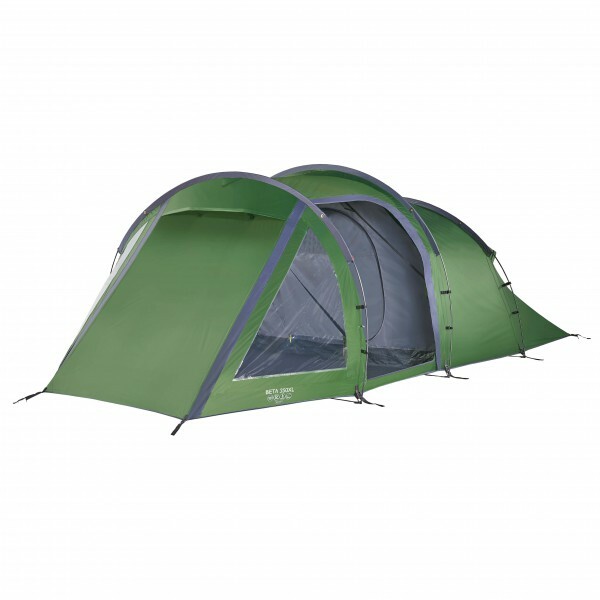 The Vango Beta 350 XL Alloy 3-man tent is perfect for camping in a group of three! Thanks to the alloy poles, strong steel pegs and TBS II Tension Band System, the Beta Alloy is extremely sturdy and perfectly capable of withstanding blustery winds and harsher weather. The three-pole tunnel tent design makes for quite the roomy interior, spacious sleeping area and large vestibule with plenty of room for all your gear. Another great addition is the groundsheet for the vestibule, which can be rolled up when you don't need it. When you do, you can roll it out and all your gear will stay dry when it rains. Another plus in bad weather: the fly and the floor have taped seams for more protection from water. The inner tent is tinted so that you can sleep in without being awakened by the blinding light of the morning sun! The entrance to the inner tent is made in part of mesh, so you'll keep the interior ventilated whilst keeping bugs out. Another great thing about this tent is that the vestibule has two entrances and two windows with roll-up curtains. With the Vango Beta 350 XL Alloy 3-man tent, you'll be perfectly equipped for your next outdoor adventure!